There are a few things that must be experienced when visiting New York City and on our 4th and final day in the city we got them all in. 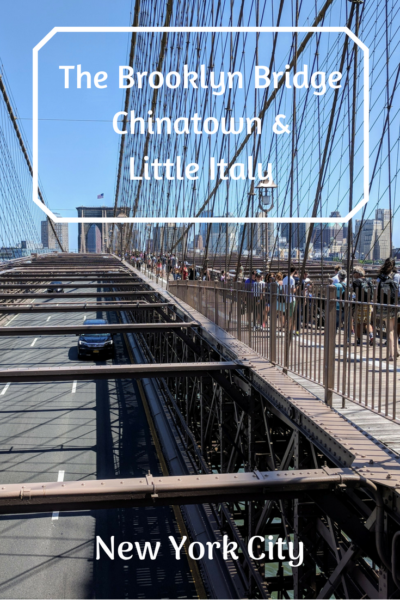 Noodles in China Town, gelato in Little Italy, taking in the views from the Empire State Building and a walk across the Brooklyn Bridge were the highlights of our day. And, we were fortunate enough to cap off such a terrific day with a stay at the fabulous Hotel Giraffe located at 365 Park Ave S.
If you’ve been with us for a while, you know well of my wicked (and frustratingly annoying) fear of heights so it should come as no surprise that taking in the views from the top of the Empire State Building was not going to happen. 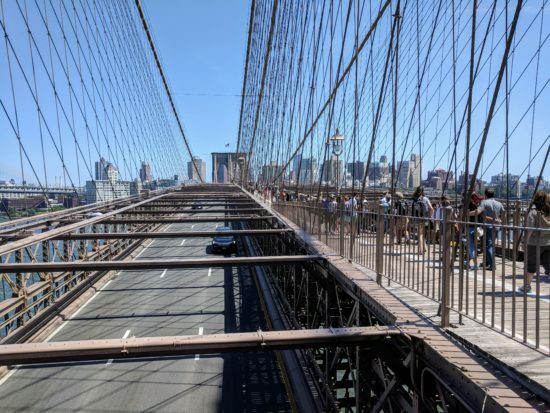 I did, however, have every intention of making it across the Brooklyn Bridge. But, you know what they say about good intentions. Stunning view from atop the Empire State Building. 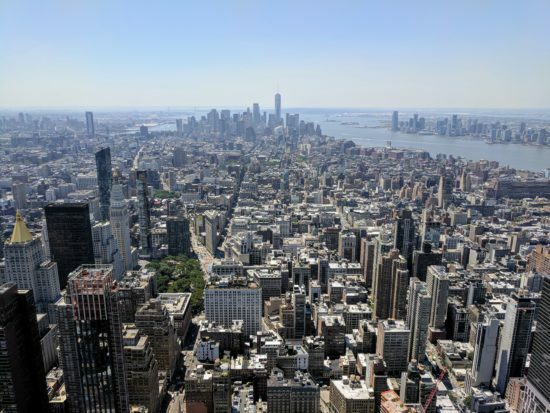 While I waited in the classic Art Deco designed lobby of the Empire State Building, Abi went up, up, up to take in the views from the 86th and 102nd floors, and gleaned some great photos of the city. It was a beautiful day and he could see for miles. The mere thought of being on the 102nd floor of a building… I can’t even. Lunch in Chinatown was the order of the day. 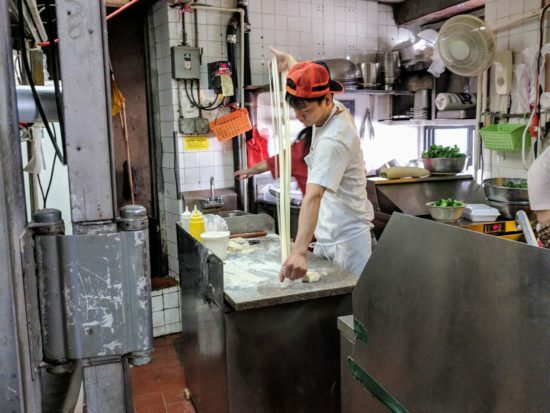 We stopped in at a tiny little restaurant where tables were crowded together and patrons could easily see the cook pulling noodles in the tiny little kitchen. The restaurant was literally named, Tasty Hand-pulled Noodles, Inc. Do you love noodles? Please tell me you do. If you find yourself in Chinatown don’t just stop for lunch. Walk up and down and across the neighborhood streets. Take it all in, the culture, the sites, the sounds, it’s as if you’ve been transported to another country, all the while never leaving the City of New York. Do you know that Chinatown, with an area of two square miles, is the largest Chinatown in the United States and has an estimated resident population of 150,000? Well, now you do. A similar experience can be enjoyed in Little Italy. If you’re going to have pizza, you might as well have yummy pizza and where better to find it than in Little Italy. Although, it can be said that there are an unbelievable number of pizza places in NYC. I looked it up. Can you guess how many? So, whether it’s in Little Italy or pretty much anywhere else in the city, you’re going to get some great pizza. Since we opted to have noodles for lunch the next best thing we could think of was of course, gelato. 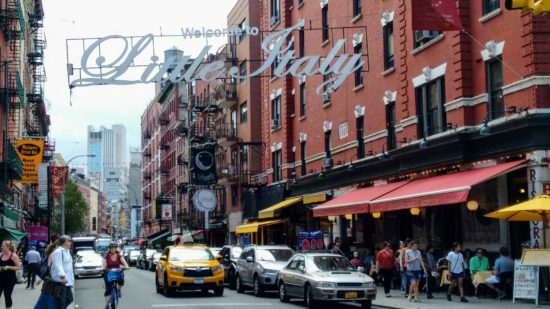 What’s interesting about Little Italy is just that… it’s little. The neighborhood – back in it’s heyday – encompassed 30 blocks in the lower east side. Now, it’s a small cluster of shops and eateries centered around Mulberry Street. It’s still a fun place to see and experience, albeit very touristy. 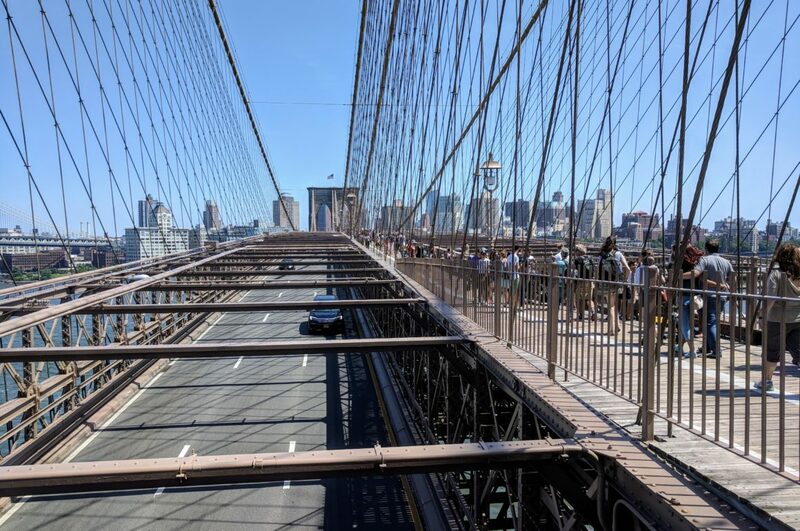 Ah… the Brooklyn Bridge. I can’t tell you how much I was hoping I could conquer the fear and walk, at least half-way, across the bridge. It can be said that there were maybe a gazillion people with the same idea that day, after all it was summer and it was the 4th of July holiday weekend. As we made our way up to the bridge I started getting weak in the knees and I knew I wasn’t going to make it. Here’s the thing about fear, it has a life of its own and there’s not a damn thing one can do about it when it takes hold. Abi braved the crowds and craziness and carried on. He made it out to maybe the second section of the bridge, far enough out that he was over the water and then said he’d had enough. Way too many people, people stopping to get that perfect selfie and the bicycles, it was a bit too much. But, he can now say he has walked the Brooklyn Bridge. I cannot. Alas. There’s something wonderfully special about a boutique hotel. 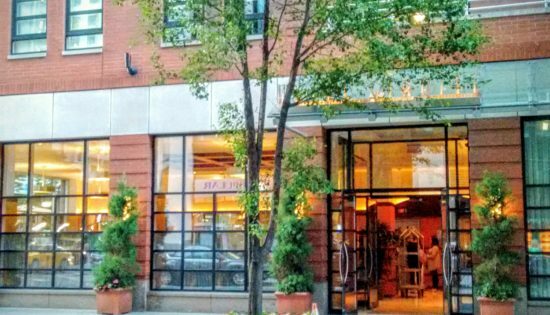 Instead of 600 guest rooms, there may be 60 in a boutique hotel. Instead of getting lost in a maze of hallways and wings in a large hotel, in a boutique hotel there is greater opportunity for a more relaxed and intimate stay. Boutique hotels are often unique in design and offer the utmost in amenities. The Hotel Giraffe is no exception. Welcome to the Hotel Giraffe. 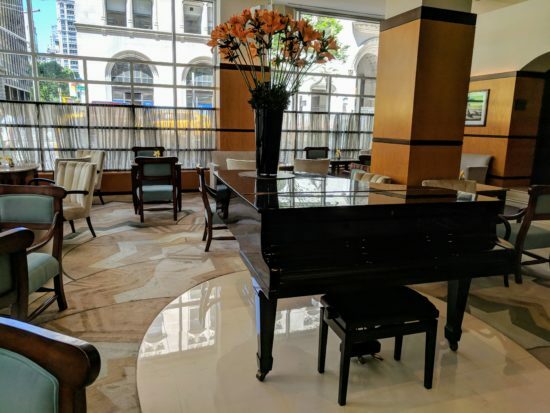 I have no idea why the Hotel Giraffe is named the Hotel Giraffe, but I like to believe it is because the hotel offers a sleek and elegantly modern atmosphere, from the grand lobby to the roof top garden. The clean lines of the paneled walls to the warm hues of the guest room decor. It all fits. It’s all elegant, just like a graceful giraffe. 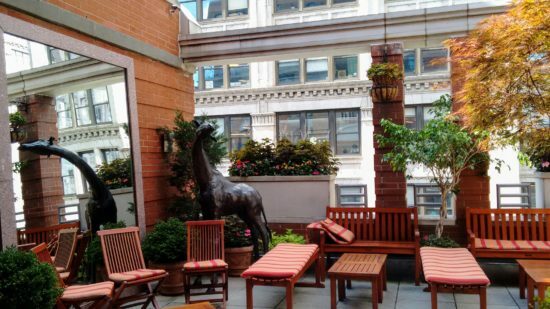 The rooftop garden under the watchful eye of the giraffe. 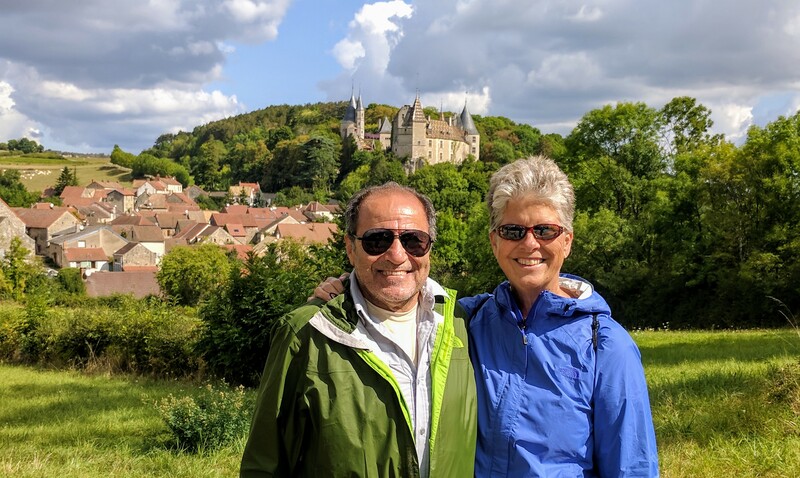 After our long day of traipsing through China to Italy to the Brooklyn Bridge – and so much more – we were ready for happy hour and definitely looking forward to it. I have to say we were getting quite spoiled enjoying happy hour each evening and a yummy breakfast each morning. Is there anything better, after a day full of adventure, than relaxing with a glass of wine with crackers, cheese, olives and nuts? I think not. We enjoyed our stays at the Casablanca, the Library and the Hotel Elysee. So much so that each evening we found ourselves hesitant to even venture out. 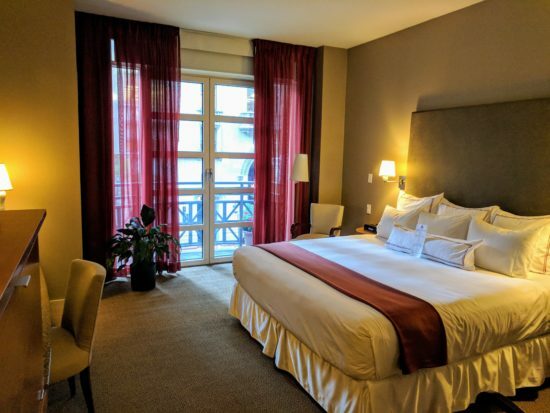 Instead, each evening we just embraced the opportunity to relax and bask in the luxury of our guest room because really, who doesn’t love staying in a luxury hotel? Our beautiful guest room at the Hotel Giraffe. Our 4-day stay in New York City was almost too much fun. I say almost because there is always something new to explore and experience. It’s a fantastic city and we look forward to our next visit. If you find yourself in New York City, and really you should, don’t miss out on all the city has to offer. There’s no other city in the world quite like it. But, don’t take my word for it, go see it for yourself! The Hotel Giraffe is part of the Library Hotel Collection and we were guests in their writer’s in residence program. Our visit to the Empire State Building was sponsored by CityPASS. You can read our full disclosures here. Crowds everywhere, seems to be the problem with cities. I could do the heights, but not the crowds. Oh Agness, if only it were that simple! NYC is a fantastic city and I’m sure you’d love it, hopefully, you’ll get there soon! Yes, Gilda, we stayed in 4 different hotels, one night at each hotel. 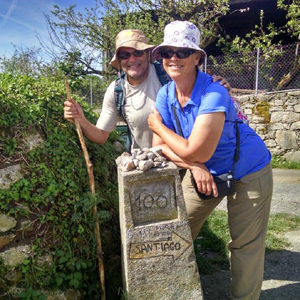 We were packed extremely light, just 1 backpack each, so it was super easy. It was definitely worth it to bask in the luxury! Spiders?! Don’t even get me started! Interesting factoid about Chinatown’s population – that’s huge, especially when you consider where we live now with many small villages and towns. I love these ethnic neighborhoods that you’ve showcased and, luckily, the US has many of these communities sprinkled about. They’re a great testimony about how immigration and diversity enrich our country ! Agree Anita, I had no idea NYC Chinatown was the largest in the country, and I was blown away by the number of people who live in such a concentrated area. A city within a city! New York is one of my favorite destinations and we have visited there in all four seasons. Spring and Winter are my hands-down favorites, although most people think we are crazy for going in Winter. Malcolm and I are the opposite of you and Abi in that Malcolm would NEVER walk the Brooklyn Bridge or ride 102 floors to the top of the Empire State Building. I will do it, for the sake of the view and of course the photos, but elevators do tend to make me a bit queasy. I completely understand the fear thing, as I have seen it first hand with Malcolm. It is not something that you can just will away. The hotels you stayed in all look wonderful. Is that roof top garden at the Giraffe open to the elements or enclosed with glass? Can’t quite tell from the photo. Probably not a great idea for January. One of these days you need to share how you got involved in the Writers in Residence program. Curious about that. 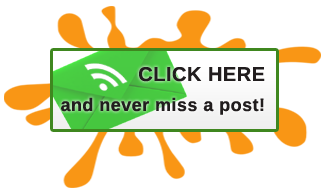 Another Pin Worthy Post by Patti – Thank You! The Giraffe rooftop bar actually has both indoor and outdoor seating. If I remember correctly they close the outdoor seating area during the winter. And, yes, as much as I wish I could “will” away the fear it’s not even an option… sadly. We love New York and actually, I think it would be super to visit in the winter because it would be a totally different experience. I’d love to see the Rockettes Christmas show. Yes, don’t look down! Yikes!